Do you think you have taste or style? Which one is more important? What do these words mean to you? People who submitted surveys received emails updating them on the status of the book, and in July I received an email with the release date and a list of book launch events, one of which was happening in Toronto. Of course I had to go, as this was the first book I had been a part of (I am quoted on page 464), and as it turns out, it's a wonderful book. 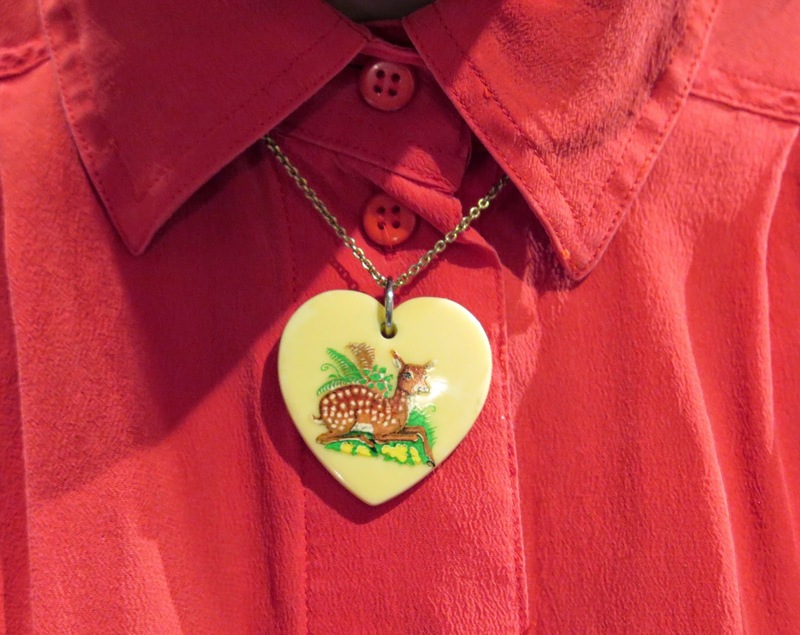 Editors Sheila Heti, Heidi Julavits and Leanne Shapton (who are all published authors) have put together a collection of essays, illustrations, photos, and interviews that address why women wear what they wear. It's not a style guide; there is no section on fashion trends, what not to wear, where to shop, or how to dress your body. There are no photos of the women who are featured in the book, which keep the focus on the stories.... and what wonderful stories they are. Each of us - young, old, rich, poor, living in India, Iceland, Texas, or Montreal, make conscious or unconscious decisions when we get dressed in the morning. 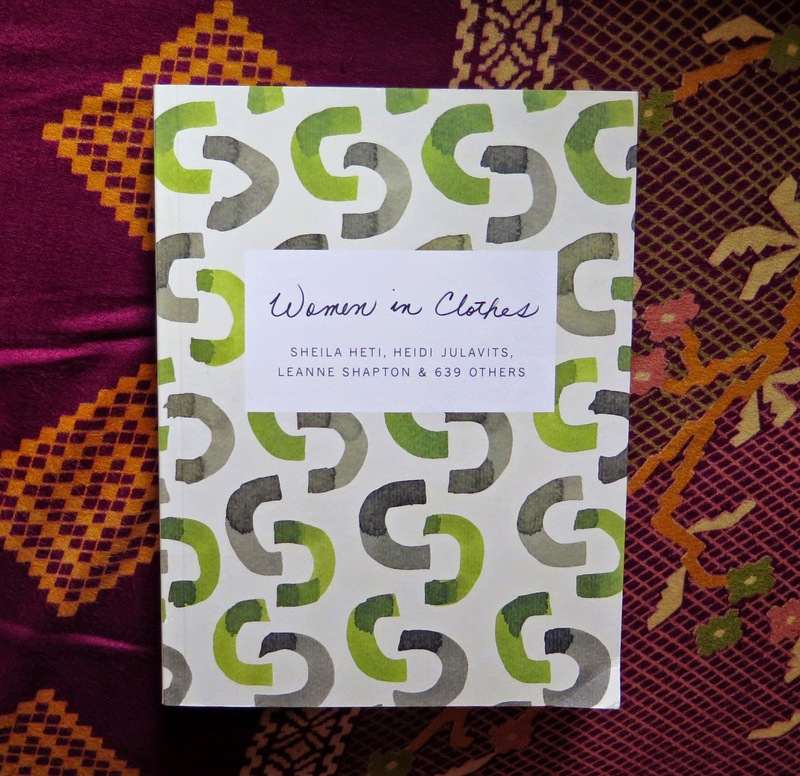 The book gives us a peek at the thought processes, emotions, and inspirations of several hundred women as they decide how to clothe their bodies. Some of the contributors are famous - musician Kim Gordon, blogger Tavi Gevinson, writer and actor Lena Dunham, artist Miranda July, etc., but most of them are women living their lives under the radar all over the world. The stories are funny, sad, inspiring, entertaining and reassuring. 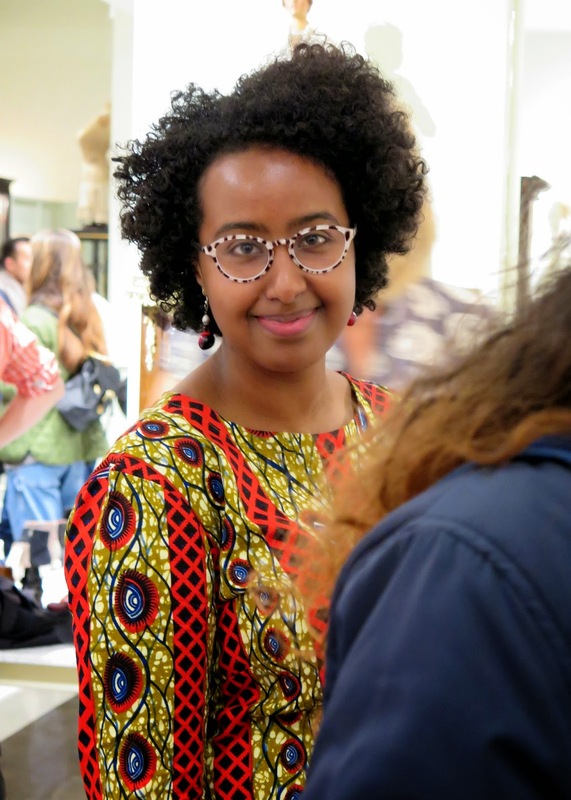 The book makes clothing into something that unites us all as women, instead of something that divides us into categories of "fashionable", "conservative", etc. and I felt a connection to the other women in the book while I was reading it. The reviews have almost all been extremely positive, but one reviewer complained that there is not enough ethnic diversity represented by the women featured in the book. While it is possible (and probably likely) that the majority of the surveys were completed by white women living in Canada and the United States, the editors include stories and interviews with women from Korea, Egypt, Laos, Cambodia, Israel, Croatia, and Poland, to name a few. To me, one of the most moving sections in the book was titled "Mothers as Others". Participants were asked to submit a photo of their mother before she became a mother and give their impressions of the woman they saw in the photo. 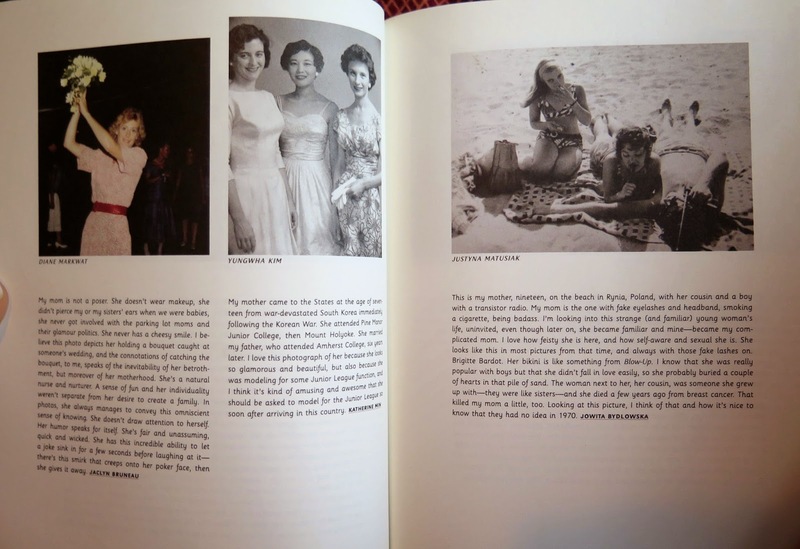 Many of the photos showed young, carefree women having fun, and I realized that I have no such photos of my mother, which made me feel rather sad. 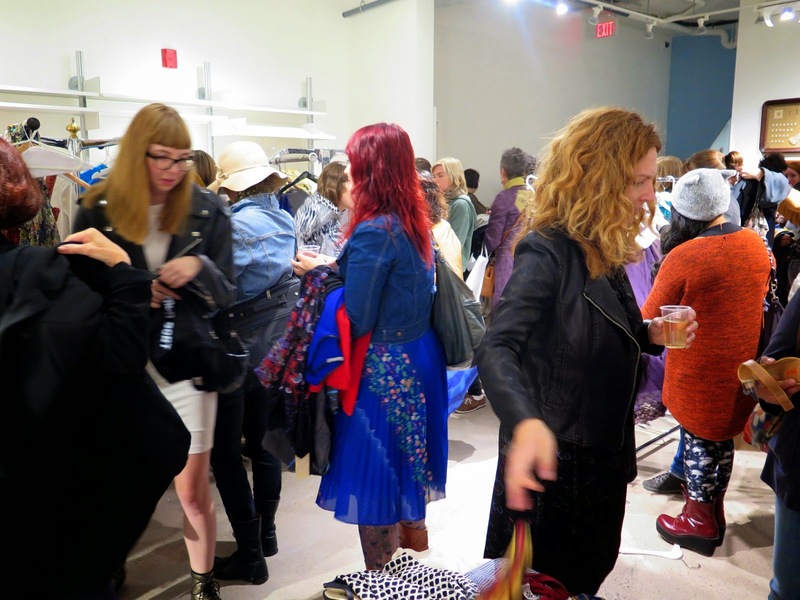 The Toronto book launch party was held on Thursday, September 8th at gravitypope, on Queen Street West. 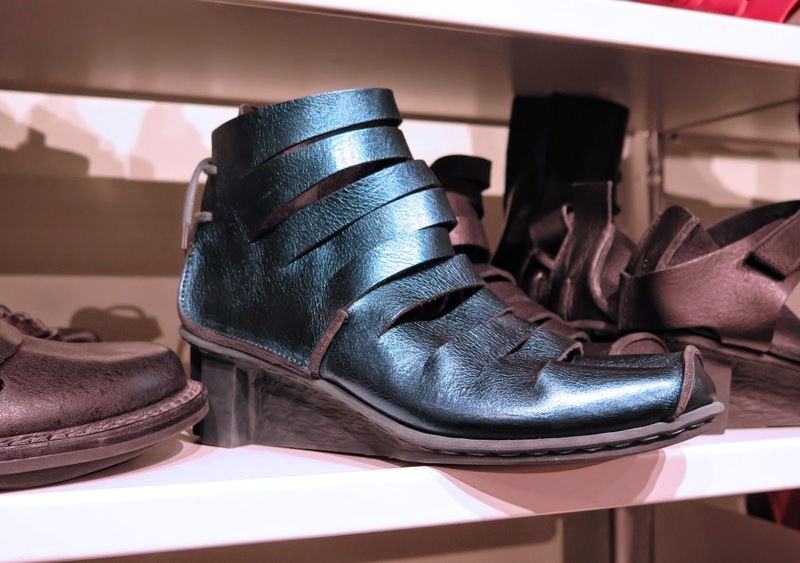 I had never been to the store, but had heard about their jaw-dropping selection of beautiful (albeit expensive) shoes. 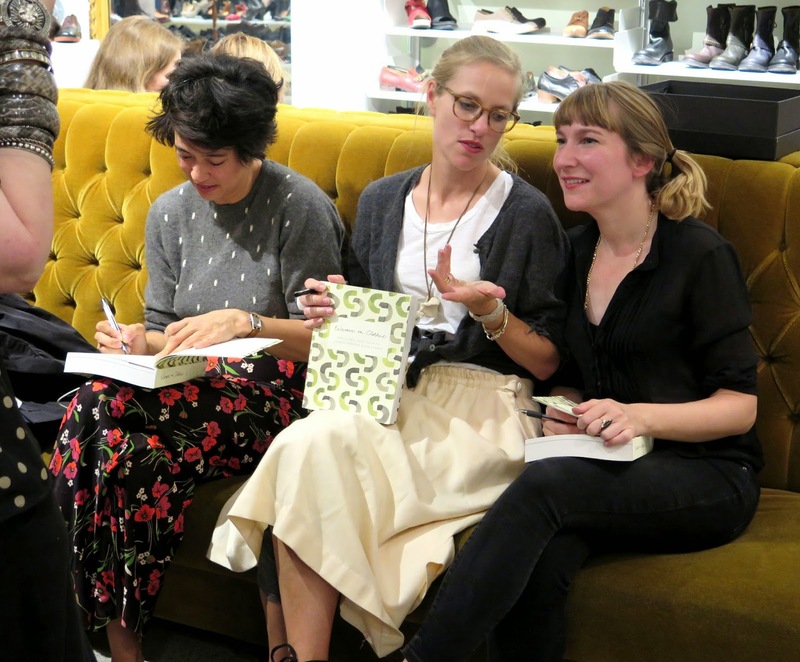 I invited two other bloggers, Megan and Suzanne, to join me. Suzanne and I spent the afternoon together (more about that in another post), and Megan joined us for dinner before we went to the party. 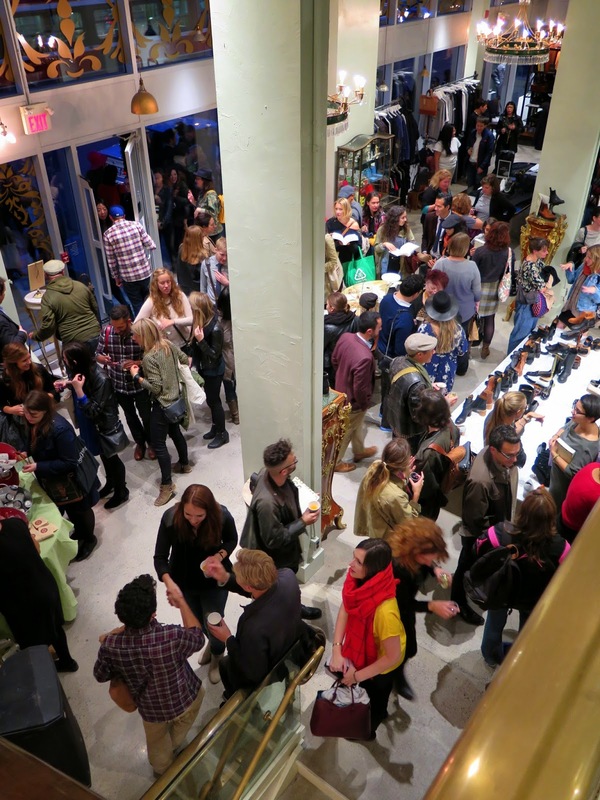 The event had been all over social media, and the editors had been interviewed that morning on CBC by Jian Ghomeshi so I was not surprised to see that the store was packed with people, with a lineup outside. It was rather claustrophobic and I found myself seeking out any little unoccupied corner of space I could find. 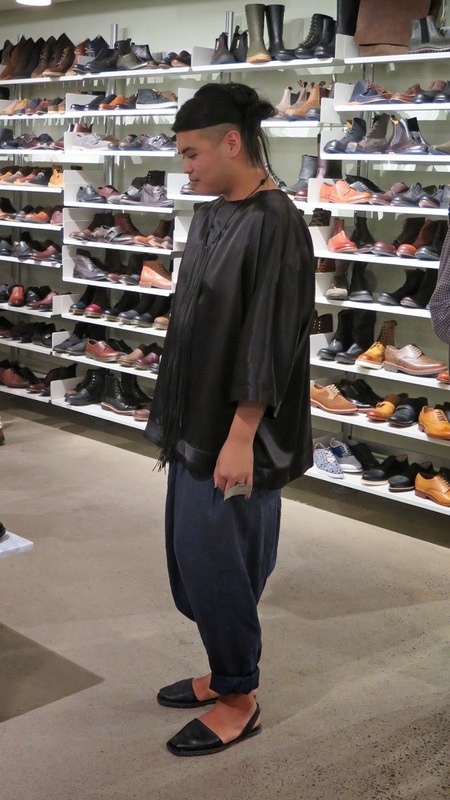 All the staff at gravitypope are quite stylish, but this young man caught my attention with his simple tunic and pants set off by great accessories. The ring! Those shoes! 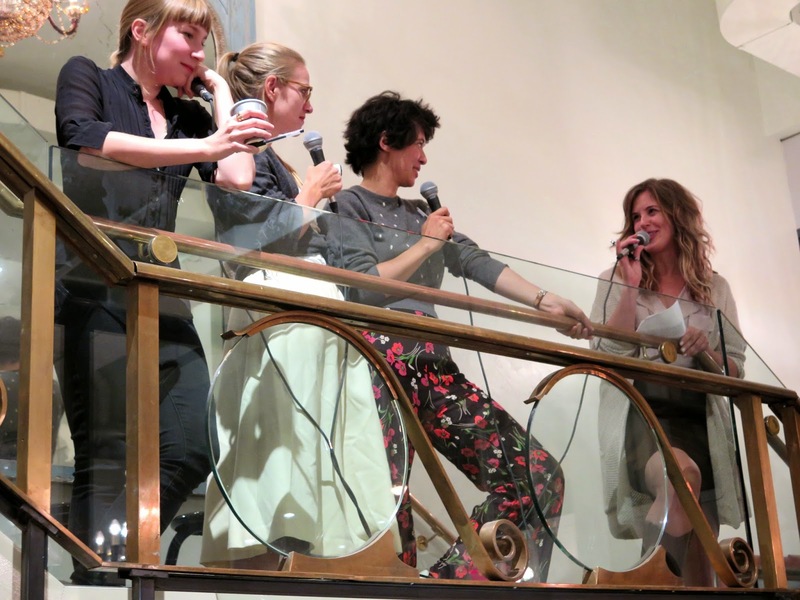 The three editors, (left to right) Sheila Heti, Heidi Julavits and Leanne Shapton, were interviewed on the store's staircase. 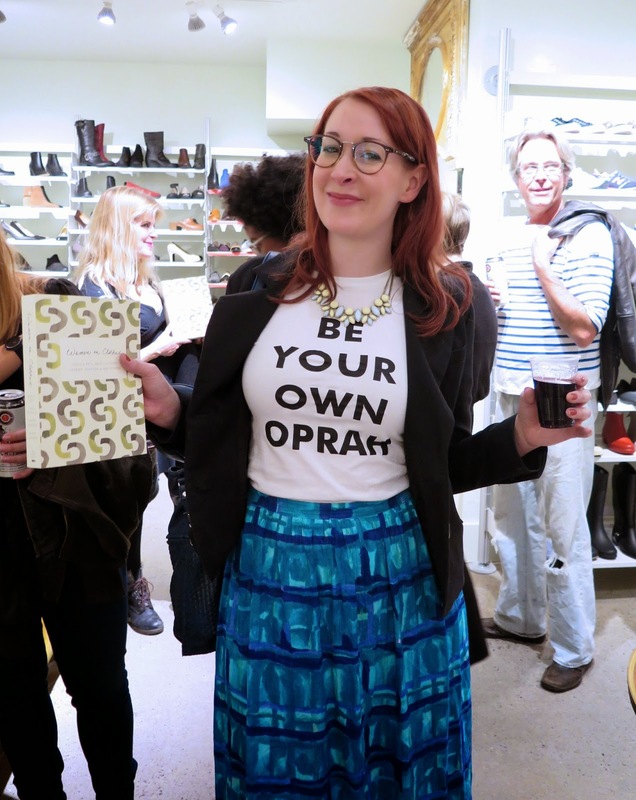 All of the book launch parties feature a clothing swap, and Suzanne and I brought some items to add to the mix. It was rather satisfying to see that the three items I brought were scooped up fairly quickly. The editors asked that women attach their name, and a story about the item, to each item they brought. Suzanne pointed out this skirt to me, and while I was drawn to the happy mix of colours, it was the story that compelled me to take it home. 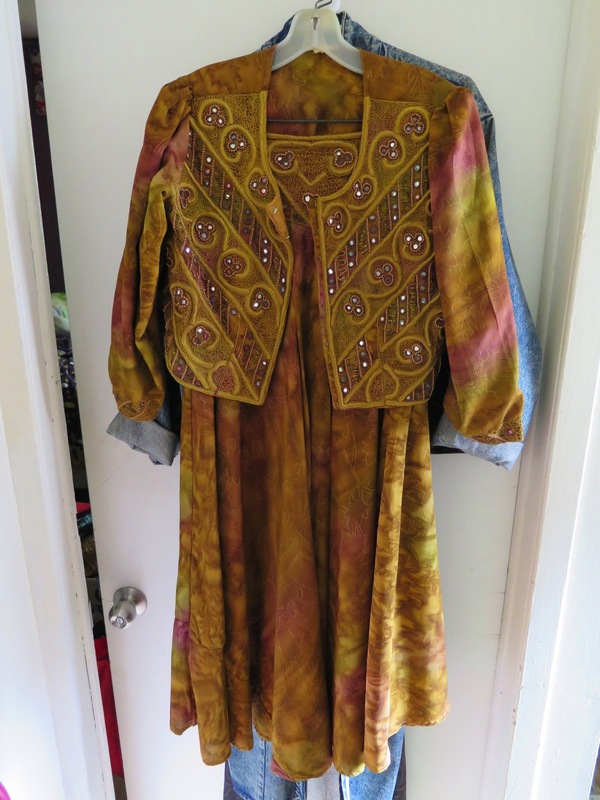 I also selected this made-in-India jacket and skirt, which had been previous owned by Annette, who, according to the tag attached to the outfit, is in her mid 50's, has three sons, and sells vintage clothing online. Suzanne (r) chatted with a woman who used to own a funky clothing store in London, Ontario back in the day and now lives in Toronto. It was a pleasant surprise to run into her. The editors settled themselves on one of the couches to sign copies of the book. This woman was in the line to get her copy of the book signed so I seized the opportunity to get a photo of her cool t-shirt. I didn't bring my copy of the book with me to get signed, but I managed to exchange a few words with Sheila Heti as she took a break from signing. She was very charming and personable, and I wish I could have had an opportunity to chat with all three editors. Unfortunately, the photo shows the least interesting part of my outfit; I also wore a flouncy vintage slip that hung below my dress, black and white tights and my pink "Krista Cons". The crowd started to thin out around 8:30 pm so I was able to get a photo that showed more of the store. 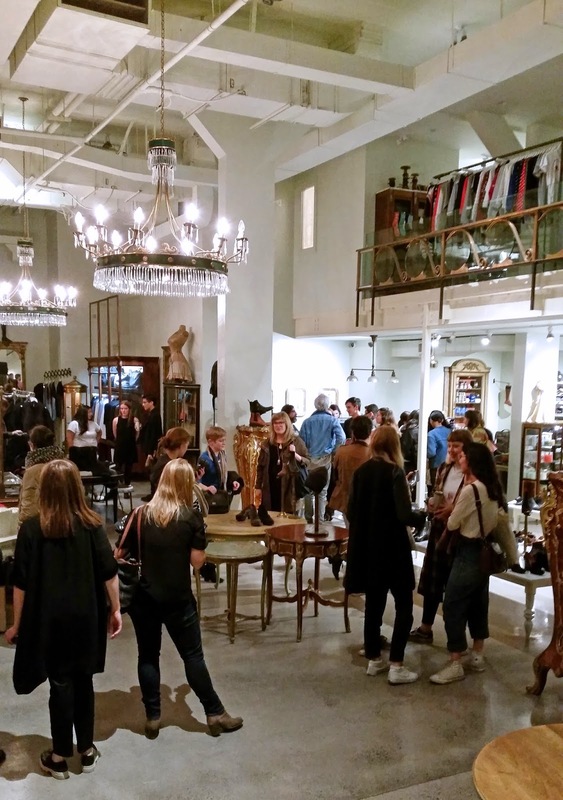 The second floor is dedicated to cool (and, of course, expensive) clothing. "Tell us about something in your closet that you keep but never wear. What is it, why don't you wear it, and why do you keep it?" The winner will be announced on Monday, October 6th. Dang that's some party, signing celebration! I was fascinated when you mentioned it to me and I still am. I think it's so cool you and Suzzane saw each other, I'm jealous!! The clothing swap is something I have never participated in but would love too, of course your stuff was snatched up, you got good taste! I'm honored my necklace came along! You look unforgettable you as always. Beautifully funky! Onto your question, I have way more than one item:). It's the sexiest floor length sequin jacket, with slits up both sides, the color is champagne and it looks like opulence. I wanna feel like I can full it off someday. I have a vintage hockey jersey from my high school team that belonged to my step dad. I wore it once or twice in high school, but haven't since. It's itchy and bizarre, but I love it nonetheless! I consider it to be "in the archives"! 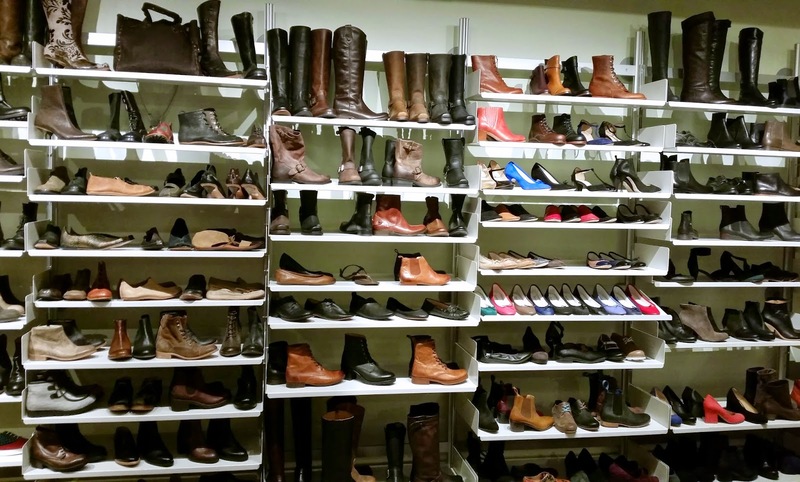 The Wall of Shoes! The Trippens! The blogger date! And that T-sheet - Be Your Own Oprah - I love it (I hate Oprah). What a fabulous evening! The book sounds really interesting, but you do not need to put me in the drawing. Someone else would appreciate it much more than I would. I will answer the question though - I have my wedding dress, which I never wear, but I'll keep it because, duh, it's my wedding dress! I did use it in a blog post last year. It's a little tight now! 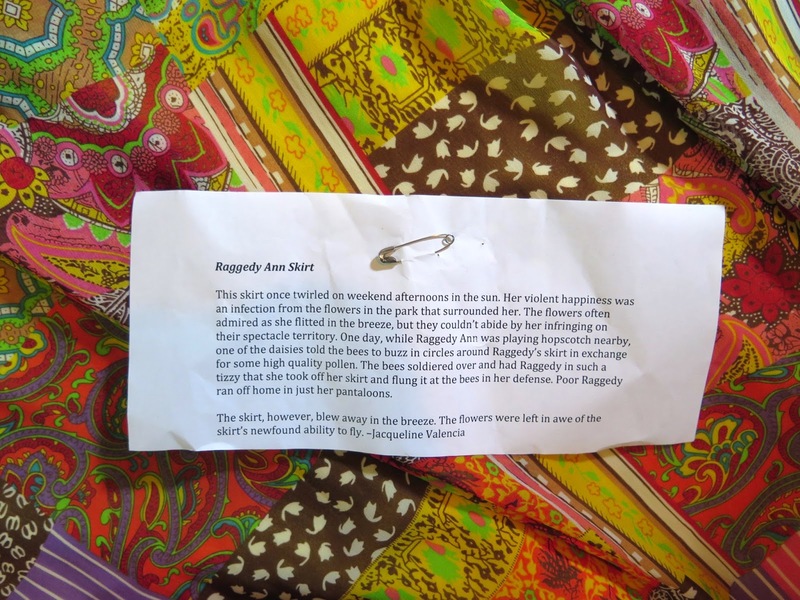 I think a clothing party at a book launch is too perfect, especially with little stories attached. Genius idea. Of course your duds would have been snapped up - as they should have been at your yard sale. Those lucky Torontonians! 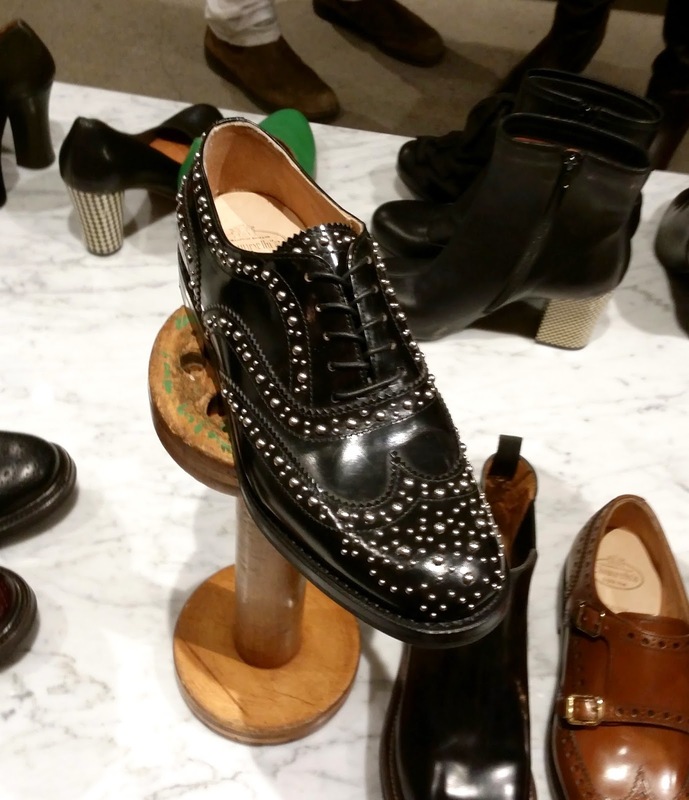 I would have fainted at the shoes and perhaps at the prices, but what a visual blast. This looks like a hip, happening party. I'm excited for you, Shelley, being in what looks to be a timeless book. I need to read your quote! Plus, you got to hook up with Suzanne and Megan. The answer: I have a navy blue baseball T-shirt my brother used to wear, short in the front and longer in the back. I used to wear it. Then my brother died unexpectedly. Now I don't wear it but I look at it and hold it. That looks like an absolutely fascinating event and the book sounds so interesting. I'm delighted that you and Suzanne had a day out together, two blogging friends taking the world by storm. Wow, Shelley - the company, the stories, and the setting - tremendous! I had to have a look and really think about your question - I keep a traditional Ukrainian dress and vest from among my grandma's belongings that I won't wear due to size and fragile condition, but everything else is intended to be enjoyed. Congrats on being included in the book! What a great event! Everyone looks so cool and interesting. What do I have but don't wear? Many years ago I bought two purple floral dresses. I wore them to everything I was invited to (and stood out at weddings as the only person wearing color, but that's another story) and both looked and felt gorgeous. Well, I've put on a few pounds and they no longer fit...but I've been exercising more to slim down and maybe, someday, my daughter would like to wear them to an event. They'll be "vintage" by then but no less beautiful. What a very interesting project with which to be involved, Shelley, and a great event to launch the book! I really like the idea of combining the book launch with a clothes swap, and the little notes attached add even more value. How lovely to meet up with Suzanne and Megan too. Yes, clothes certainly have a lot to say about us, and our relationship with them can clearly be highly personal and emotional, as witnessed by some of the stories in the comments above. History, family, significant events, loss, a representation of who we were, or who we want to be - those unworn items you asked about encompass so much. I deleted my earlier comment as it was about something I still wear- oops! As I said before though, lovely day, lovely store and congrats on being in the book! There are quite a few pieces that I have used in photographs but have never worn out in public. Perhaps there will be the right situation, or I might use the material to alter into another garment. No bashfulness here - while you can read all my survey answers on the book website, they only used a one sentence answer to one of the questions in the book, and it's not particularly interesting or provocative. Nevertheless, it is wonderful to have been involved in the book at all. AND I see I misspelled your name! Sheesh! What else can go wrong?! It was so fun to do this with you Shelley and meet you in person. I'm so happy you invited me and we made a day out of it. It was nice meeting Meagan as well. I can't wait to see you wearing those items. I have decided to give that sweet dress I got to my niece. I think it will fit her perfectly. I hope you got the file I tried to share via Dropbox. There were more photos there. I'm still hanging out with my sister till the end of the week. I really cannot think of pieces in my closet that I don't wear at all. There is one t-shirt that I painted by hand for my husband when we met that I also used to wear of Gaston Le Gaffe that I have kept in the hall closet, strictly for sentimental reasons. I still want to contribute to this contest so here goes. What a fabulous event Shelley! I have those vintage dresses i purchased in San Francisco that i never wear,go figure! hi Shelley! I purge my closet all the time to make room for more clothing of course so I can honestly say I wear it all! But please, can I be in the draw? I have a number of items of clothing that I appear to have bought for a life I don't have. The shiniest example is a pair of bright red patent leather four-inch open-toe stilettos with a bow on the front. I used to visit the Gravity Pope in Vancouver, but now I visit a different section of town when I go over. I keep two sweaters that my mom made for my dad when they were dating, which would have been in the early 60s. One is an oatmeal cabled cardigan, with leather woven buttons - it is one of a pair (I have my dad's, and I gave away my mom's when I was in high school). The other is a green pullover that has knit cabling. I used to wear it as a (very large) oversized top with skinny purple bleach-distressed jeans (made myself) when I was in university in 1985. I used to spray both sweaters with Jovan musk (I loved it back in high school) to get rid of the wet-dog wool smell. My dad died when I was 29 (he was 55), and even though I have now owned the sweaters longer than he did, every so often when I clean out my closet, I'll put them on and pretend I can smell my dad (I swear I smell a bit of musk!). It's like getting a hug from him. He died 17 years ago as of last Monday. We live in a society that, whether we like it or not, places a high premium on how we look in our clothes. This has to be the best blog post idea I've ever seen! I love it! This post is SO well written, and your photographs are really lovely. I'm so impressed! You're really talented! I landed on this page through Waist Cincher search. This post is really informative. Thanks for sharing.